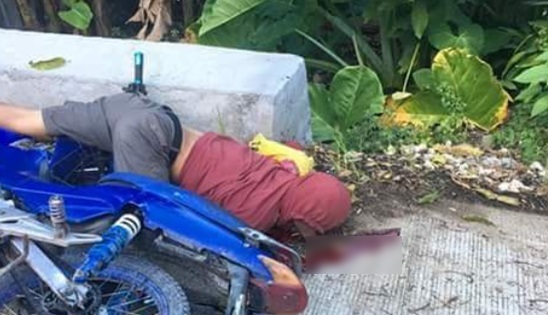 A known drug personality was shot dead by a still unidentified motorcycle-riding gunman who rode in tandem with another suspect along the national road in Brgy. Pinaygan, Tubigon at 6 a.m. on Saturday. Authorities identified the victim as Alan Samuya, 43, of Barangay Poblacion in San Isidro. Based on investigation by the Tubigon police, the victim was driving towards Clarin town on board his motorcycle when the assailants started trailing him. The motorcycle passenger, suddenly shot Sumaya multiple times, while both the suspects’ and the victim’s vehicle were moving. Sumaya sustained gunshot wounds in his head and other parts of his body leading to his instantaneous death. According to witnesses, the suspects covered their faces with cloth while travelling aboard their motorcycle which had no plate number. The suspects fled towards Clarin after Sumaya crashed and fell to the ground. Meanwhile, police recovered from the victim a packet of suspected shabu and hidden inside an empty ointment conatainer, cellphone and wallet. Four spent shells fired from a .45 caliber firearm were also found in the crème scene. According to PO2 Diosdado Sumipo of the San Isidro Police Station, the victim previously surrendered uner Oplan Tokhang as a drug user.